Social Media: The Haze is Lifting and the Landscape is Coming Into Focus. Susan T. Evans is a senior strategist at mStoner and chair of the 2012 CASE Social Media and Community Conference. Before mStoner, Susan was the first director of creative services at the College of William & Mary in Williamsburg, Va.
Senior administrators understanding what a hashtag is? Check. Facebook and Twitter icons on your home page? And, check again. Most of us are using the right tool for the right job. 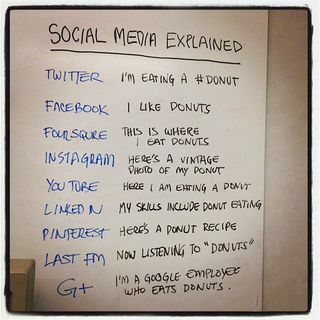 Perhaps you saw the “social media explained” photo I’m including in this post. I saw it first on @ThreeShipsMedia. Let’s face it, for a while, social media channels were generic. The only goal—the simple intent—was to have a conversation. While it’s still about conversation, the Twitter post is not the Facebook update is not the Pinterest pin. And there seems to be less reliance on an approach that simultaneously publishes the same content to all social channels. Most of us are packaging content differently depending on the channel or we are using certain channels for certain types of communication. Thanks to mobile, social media is now a push technology. The first time I suggested social media as an official communication channel, many resisted it because they preferred to “get it in their email.” There was a fear that if we didn’t use a push technology, the audience simply would not bother to come to us for a message. Mobile changes all of that. I’ve characterized mobile as social for quite awhile now. And, the proliferation of mobile devices (some claim that 50 percent of undergraduates have smartphones) and apps means we can be almost certain that our social media content streams are being regularly pushed to the audiences we want to reach. Nowadays, our audiences always have their small screens with them. People, not brands, use social media. There is social media noise but we’ve learned that the authentic voices are more likely to get attention and responses. Why explain this further when Lori Packer’s recent post provides an excellent summary? Enough said. Bring the campus life section to life with social media. These days, integration of the official web presence with social media content streams is default; it’s expected. Back in the day, the lighthearted content of a college or university website was contained in its campus life section. Do you think you could crowdsource the campus life section of your website? Do you think official higher education websites have improved because of the “external pressure” from the looming social media content on the periphery? If your view is still hazy, sharpen your focus by consuming the best of what’s out there. Blogs like this one and conferences like CASE Social Media and Community are tremendous resources for sharing ideas and keeping your communication strategy rich and relevant. Hope to see many of you in Chicago for #casesmc. Someday, social media will take over the telecommunication industry. As the internet gets even more mobile, more people would turn to smartphones and iPad over telephones and computers. The younger generation today already uses social media as a means to communicate. Its use would expand even further in the future. You’ve hit the nail on the head, Brandon. The question of ROI is still largely unanswered. At the moment, many of us are pointing to increased engagement and counting that as success. If you agree that student and alumni engagement is social, then I don’t think we are teaching students to blindly follow. I’m looking forward to a #casesmc presentation by Andrew Gossen and Patrick Powers around this topic. Sorry you won’t be in Chicago for the conference but I’m sure Andrew and Patrick will share their slide deck. I have yet to see any definitive results showing how generic social media platforms are improving institutional objectives or student success. Sure you can post content to different “social” websites and aggregate all those website feeds into your website, but is that really social? Are students talking to each other, starting projects and sharing ideas, or are we instead teaching them to blindly “follow” the latest social networking trend?